Oprah, A&E, TLC, and various web sites have caught America’s attention with the compulsive disorder of hoarding. Various sources try to attribute the condition as an inherited disease, damaged parts of the brain, emotional damage, etc. 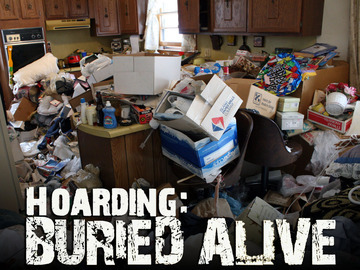 but the end result is the same â€“ people collect so much stuff into their homes that they are literally buried alive. They stop seeing how the trash begins to decompose, or the smell from dead animals or excrement has increased in the home, or how they are slowly losing whole parts of their homes to piles of stuff (kitchens, bedrooms, bathrooms etc).â€” when asked to make a decision regarding one piece of the pile it becomes stressful and they become anxious. Eventually family members, adult children, landlords, or someone will draw attention to the unsanitary and unsafe living conditions of the home and they are forced to do something about their situation. 1. Invite a Friend Into Your Home. But honestly, you probably already know what needs to be done, and you have simply stopped trying to fix it. Knowing that your friend is coming will energize you to finally fix it after all. 2. Organize Room by Room. Hoarders feel overwhelmed with the mountain of work and often are paralyzed with anxiety of not knowing where to start. So, the professional organizers start with a room, empty it out completely into the yard, organizes the stuff (things to keep, things to throw away, and things to sell), and then they organize and plan the room as it should be. So pick an area that needs to organized, break it down to its simplest parts, and rebuild it as it should be. Donâ€™t try to fix everything all at one time. This will stress you and the people who are helping you. Instead pick the most glaring problem and deal with it. Most issues that have been put off cannot be dealt with in one meeting or in a week. So put in on a dry erase board in your office, schedule a follow up meeting, or ask someone to hold you accountable on the issue — Just keep it in front of you until it is dealt with. Don’t allow it to go back onto the pile of other issues you haven’t dealt with yet. 3.Â Be Smart About Your Emotions. With most hoarders there is an emotional trigger. It could be the death of a loved on, the loss of a job, abuse of some kind, or depression, but usually something happened to trigger the hoarding behavior. What happened in your leadership that may have caused you to stop trying to deal with certain issues? Go back and deal with the emotional issue, then go on to fix the existing issue. Did someone push back when you tried something new? Is there someone who embarrassed you in a staff meeting or church business meeting or someone made you feel that you were of little value to the organization, then you unconsciously decided just to quit trying. Whatever it may be, we are called to do our best for the Lord. We are not just to get by with mediocre quality in our organizations. There is a reason why you stopped working on specific issues. Â Make sure that you are not mad at someone, have given up out of frustration, or simply quit caring. 4. Understand the Consequences of Not Cleaning Up. What drives many hoarders to clean up their homes is the fact that if they donâ€™t they will lose their homes, apartments because of the unsanitary condition. While this is tragic, in church life if we ignore certain issues (especially if they are easily fixable) then people will not return after an initial visit. If the nursery is not painted, greeters are rude (or even worse no one speaks to them at all), they get lost on your campus, or something along these lines then there is an opportunity lost to share the gospel and influence their family for Christ. For a hoarder to stop trying is to lose oneâ€™s home. For the Christian leader to stop trying is to lose oneâ€™s purpose. To lose one’s purpose is to lose passion — which is devastating. Start your clean up today. Katherine Harmon of Scientific America.